Measuring the socials by social! Wondering how the social media giants cope with their social performance? 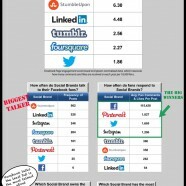 Faceboom outperforms in most metrics being the least loudmouth while getting the most exposure. Magic?